Hmm. With a full-time job and a fairly busy family life, finding time to relax can be tricky. It’s so important though to find a few minutes in the day to yourself, free from the day-to-day chores, running around doing stuff for other people. 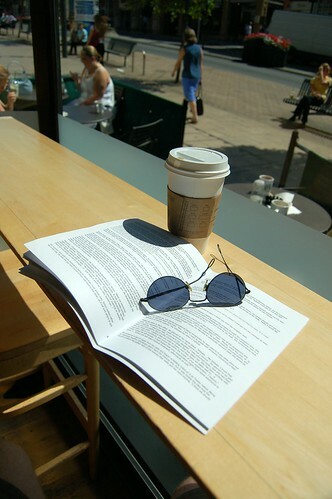 During the week, I like to get out at lunchtime to a coffee shop with a good book. It’s usually a Starbucks – I know they’re the antithesis of my beloved indie coffee shops, but I don’t feel quite so bad about paying £1.50 for a mug of coffee and sitting for 45 minutes reading my book. The book of the moment is Scott Lynch’s The Republic of Thieves, the third book in an ongoing series. It’s really rather good and I’m taking it quite slowly, not really wanting it to end as the gap between book #2 and book #3 was rather a long time! I’ve got a few more books lined up after this one though – Tom Lloyd has an interesting one coming out next week called Moon’s Artifice, and I’ve still got Terry Pratchett’s latest waiting to be read. So, coffee shop and a good book is one way I like to relax. Others? Sitting down after a hard session down the allotment. Chilling out to some music on my morning commute. Floating in the surf with my bodyboard, waiting for the perfect wave. Sitting outside my tent late at night with a glass of something nicely alcoholic, watching the stars. It’s lame but I quite like going to the gym… or watching totally brainless telly.